If you are a Microsoft enthusiast or follower, you probably don’t need any introduction to Microsoft Ignite, the annual event that covers all the enterprise-based hardware and software launched by Microsoft. While it may show its prowess on the consumer tech sector, most of the revenue for Microsoft comes from its backend solutions to enterprises and big businesses. The upcoming Microsoft Ignite conference thus promises a roof for all like-minded IT and commerce professionals to get together and network for better projects in the future. The company flagged off this year’s conference with the following words. 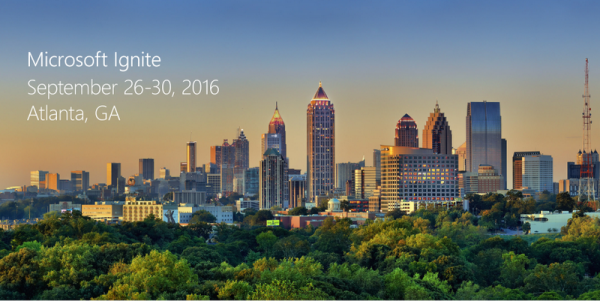 To be held from September 26-30, 2016, Microsoft Ignite will take place in Atlanta, Georgia this year. While the event has nothing from their consumer lineup, it is still interesting to note how Microsoft has shifted on slowly to independent events instead of focusing on collaborative events, such as the CES or the MWC. Windows 10 will obviously be the biggest focus for Microsoft at this year’s Ignite. Being the most successful PC software for Microsoft yet, Windows 10 is the future of computing when it comes to working on Windows-based devices. This will be one event that a lot of OEMs like Dell and HP will be glued to, hoping to see some great new features and additions to the operating system. Apart from the usual software talk, Microsoft will also announce big plans of collaborating with various hardware manufacturers to develop better tools to help you work with Microsoft services in an efficient manner. The Show Floor always has some of the most exciting technology and this year will be no different. You can expect to see some futuristic tech, especially in the fields of virtual reality or robotics. This is the most important aspect of the entire Ignite conference. This event is where Microsoft showcases all of its new products, services, and tools. These areas will be represented by Microsoft Program Managers and marketers, but it is also a great chance for you to go out there and network with Microsoft employees or even your counterparts from other companies. The venue will also pack in some extra amenities for all visitors. Every year, Microsoft sets up a huge Microsoft Store that showcases multiple demo units and experts for their new products. This is a great place to check them out and get in-depth knowledge about each of the products and services. The venue even has some beer gardens and cafes in case you are interested. So, that is all the predictions and details about Microsoft Ignite 2016. It will be a huge year for Microsoft as it is now in a great position in the market, and will aim at showcasing products that maintain the standings.